Fits 2) 5.0 x 5.0 x 5.0mm trillion stones. Sold as setting only, gemstones are optional. Cast per order using molds of actual antique earrings or original hand carved dies. Fits 2) 5.0 x 5.0 x 5.0mm trillion stones. Sold as setting only, gemstones are optional. 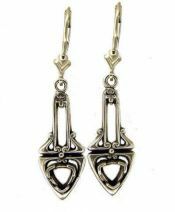 Cast per order using molds of actual antique earrings or original hand carved dies in 14k, 18k, or platinum.